For an Easier and More Effective Preschool Transition! 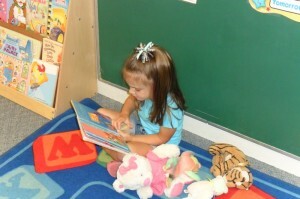 Brandi’s Place provides plenty of choices for your child to explore and grow! The beginning preschool program for three year old’s at Brandi’s Place Early Learning & Childcare Center is a nice transition between the toddler rooms and the more formal preschool setting. As with the other rooms in our childcare center, the beginning preschool room offers a warm, nurturing, structured, and fun environment for your child to learn, grow and thrive. 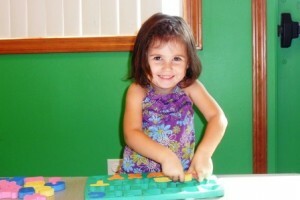 In our beginning preschool room we continue to work on your child’s growing independence. There are some milestones they will continue to work toward at home and childcare, and we encourage parents to be completely involved in this process. Brandi’s Place staff works with your child to ensure that they can put their coat and shoes on by themselves by the time they leave this room. We will also continue to work with children on potty training. These objectives must be met before they can move on to the regular preschool room. Your child will learn a lot in this classroom! We start by testing children to see where they are at with their skills in regards to kindergarten readiness. This allows us to know where your child needs the most improvement, and we can work with them individually and in groups to increase these skills. When a child reaches 75 percent readiness, they are ready to move on to the regular preschool room. In addition to basic skills necessary for kindergarten readiness, your child will continue learning some basic sign language in this class. Smaller class sizes allow more individual attention for your child! We also will be reinforcing the Spanish started in the toddler class, namely their numbers and colors. Your child will also learn the days of the week, please and thank you, greetings, and the months of the year in Spanish! Everything your child learns in this room will be on a similar schedule as the toddler room. 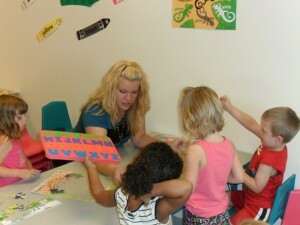 They will have circle time, art, music, and other scheduled activities, such as a perennial favorite, puzzle time! In addition, we will start using handouts or ditto sheets to reinforce skills. These sheets will encourage children to begin writing and coloring correctly by holding a pencil or crayon in the correct manner. Worksheets will be completed individually or in groups, depending on your child’s needs. We will be happy to visit with you, introduce you to teachers, and present you with any information you desire. We look forward to meeting you and your family.